I COULD HAVE told them a year ago, perhaps two, this would happen. But they waited until it did. Good that nobody died. Over many months, during our morning walks, it was like watching that finale in Sam Peckinpah’s The Wild Bunch: slow-motion mayhem. Finally, the roof perished completely. Collapse! This end of our neighborhood plaza possibly dates from the 16th century. Lordy knows how long that roof had rested there. But then it decided on a total siesta. Adiós and goodbye. 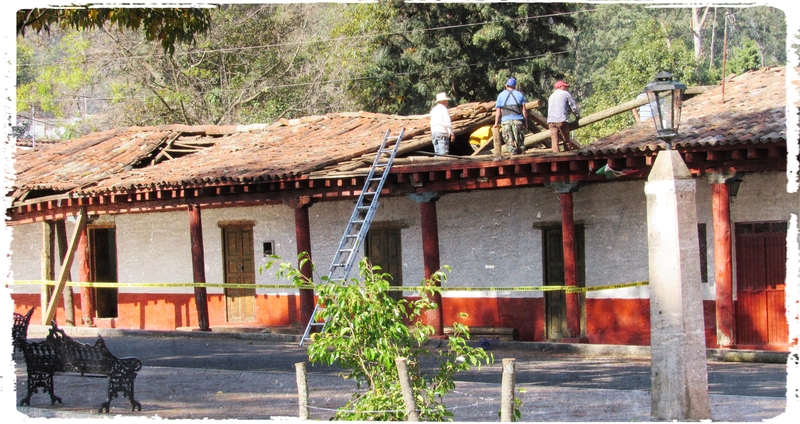 They’ve been working on it for a few weeks now, slowly at first but picking up speed, and before long it will look as it did way back when Cortés walked around the middle of Mexico.